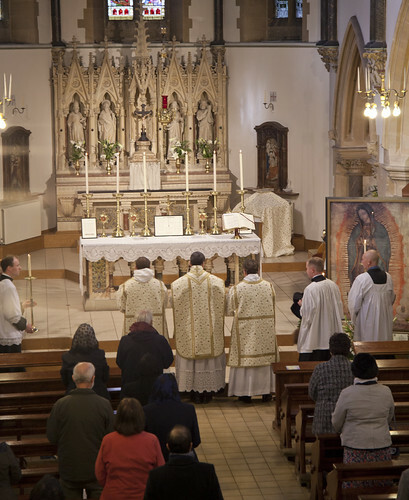 The church of St Joseph, Bedford, has one of the limited number of specially produced replica images of the famous tilma in Mexico, which have been touched to the original. You can see it above and below in the sanctuary of the church. 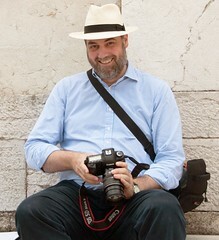 The image regularly tours the country, but this is its home. St Joseph's is a fine church which has survived the liturgical reform pretty well. 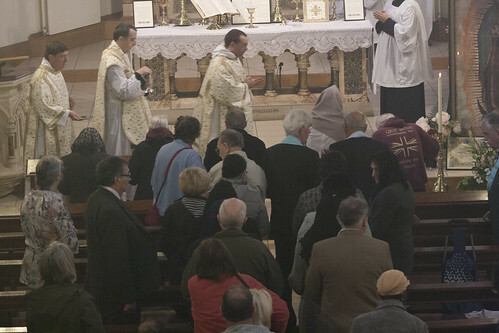 The LMS' Mass was well-attended, with 86 (I am told) present. 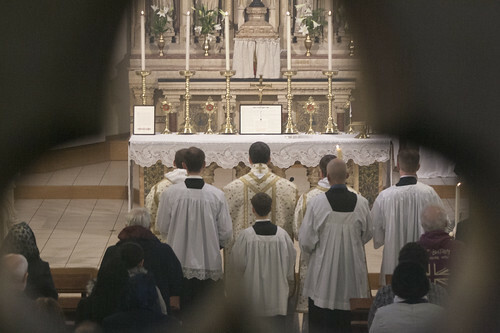 There is a regular Sunday EF Mass celebrated in the next parish, Christ the King, served by the FSSP. 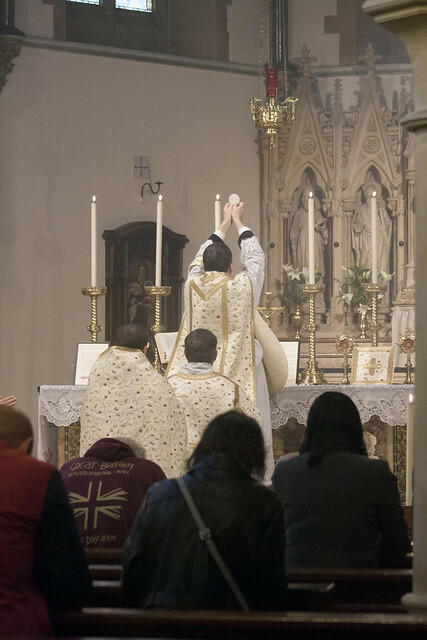 The regular celebrant of that Mass, Fr Patrick O'Donohue FSSP, was the celebrant of this High Mass. 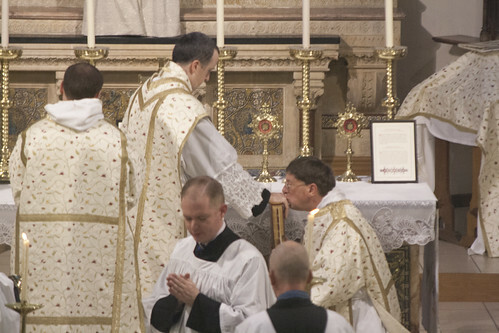 He was assisted by Fr Michael Cullinan as deacon and Br Albert Robertson OP from Oxford as subdeacon. 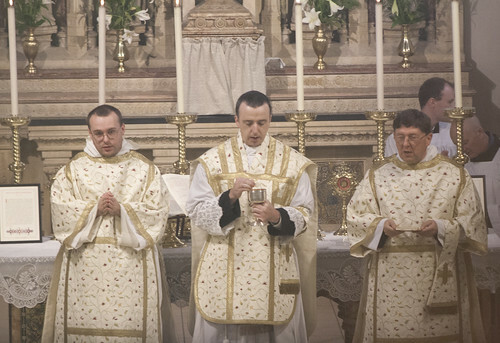 Servers came from a wide area; a small chant schola was led by Matthew Schellhorn. 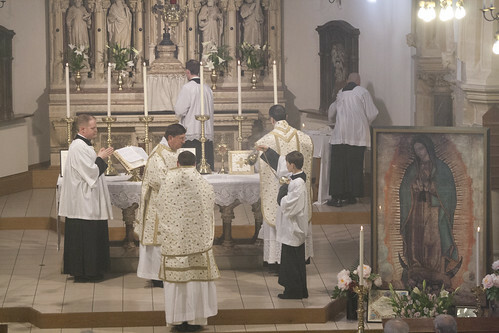 This being the first Mass of its kind we faced a number of practical obstacles, but it all came together and I hope the Pilgrimage in honour of Our Lady of Guadalupe will be a regular fixture in future years. Many thanks to the indefatigable local LMS Representative, Barbara Kay, the Parish Priest who welcomed us, Canon Seamus Keenan, and the shrine 'Guardians' who looked after us.